Dive Bar Tops The Charts!!! 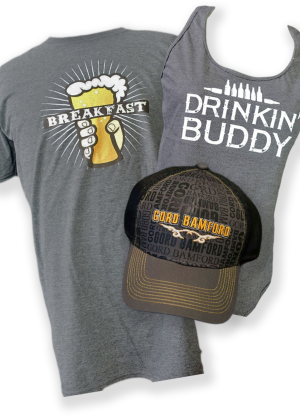 TORONTO, ON – September 17th, 2017 – Platinum-selling Sony Music Entertainment Canada recording artist Gord Bamford, celebrates impressive milestones today as his latest single “Dive Bar”, from his current album Neon Smoke, hits #1 on the Nielsen BDS Country Airplay Chart. Written by Award-winning Canadian singer-songwriter Tebey (Justin Moore, Big and Rich, Emerson Drive). 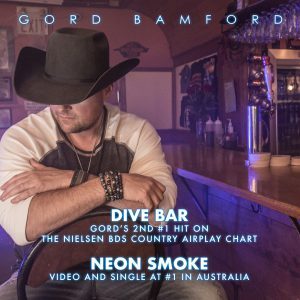 “Dive Bar”, joins Gord Bamford’s previous #1 single “When Your Lips Are So Close” (November 2013 – from his Country Junkie album released October 8th, 2015) confirming great songs produce great results. Bamford‘s latest album Neon Smoke, has also seen the release of the singles “Livin’ On Summertime”, “Ain’t It Grand” – a collaboration with Blue Rodeo’s Jim Cuddy, and the Top 10 Canadian country radio hit “Neon Smoke”. “This is a huge day! Thanks to Canadian country radio for all the support and dedication on getting this to #1. Great songs still do win I guess, so thanks to John, Ole´ and Tebey for the song. I want to thank Sony Music Canada, Warren Copnick and the SONY Music Canada Promotion Team for a fantastic job on “Dive Bar”, says Bamford. Neon Smoke is not only reacting with Canadian country music fans. Today the first single and title track currently sits at #1 on the CMC charts in Australia, where Bamford was born and lived until the age of 5. The video for “Neon Smoke” is currently #1 on the CMC charts as well. Bamford embarks on a nine city Australian tour commencing September 28th before he returns to Canada for his Honkytonks & Dive Bar Tour. Beginning in Calgary, AB on October 17 the tour will hit 31 Canadian cities from coast to coast, giving fans the chance to see one of Canada’s biggest Country music superstars in an intimate setting, at their favourite local bars and honkytonks.